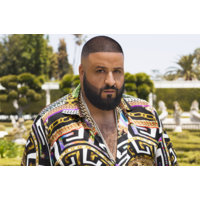 Khaled Bin Abdul Khaled (born November 26, 1975), better known by his stage name DJ Khaled, is an American record producer, radio personality, DJ, and record label executive. He is a radio host for the Miami-based urban music radio station WEDR and the DJ for the hip hop group Terror Squad. In 2006, Khaled released his debut album Listennn... the Album. Following were We the Best (2007), We Global (2008), and Victory (2010). In 2009, Khaled became the president of record label Def Jam South.